Teens and Pre-teens can now explore data science. Announcing new program: Python and Data Science. STEM For Kids is a story of numerous “firsts” for children. Keeping up our reputation as the trailblazers in the education enrichment and services for school age children, we are thrilled to announce another industry first! Data Science skills are in high demand across industries like technology, business, finance, healthcare, academia, government and more. 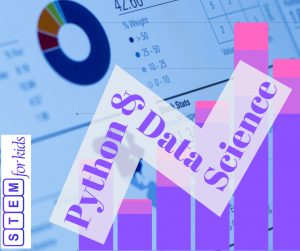 Our newest program, Python and Data Science is an introduction to the versatile world of data. Students will learn to code using Python Programming Language, and use Python to analyze, visualize and present data. Children will review Walmart’s sales data as a sales analyst. As a marketer, participants will review website traffic data as tracked by Google. Youths will also get into step into the shoes of a financial advisor and a researcher with Center for Disease Control (CDC). Python is an in-demand computer programming language, used by companies like Google and Youtube. For more details on our extensive line-up of computer programming and coding curricula for school age students, see https://stemforkids.net/programs.